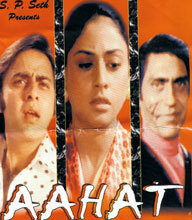 The Vinod Mehra, Jaya Bachchan, Amrish Puri starrer Aahat – Ek Ajib Kahani, directed by Kishore Rege, will release this year on 26 February 2010, 36 years after it was completed in 1974. 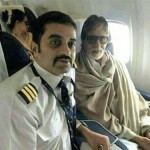 Salim Jafer, who is distributing the film in India, confirmed and said, While Vinod Mehra and Amrish Puri are no more, Jaya Bachchan has been informed about the release of the film. 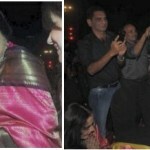 She told us, ‘Bahut achhi baat hai ki aap is film ko release kar rahe ho.’"
When asked about what led to the extremely long delay in releasing the film, Salim said, "We had some problems which I don’t want to talk about. Then the producer of the film, Franklin Fernandes, passed away. We are very proud of the fact that we are releasing a film, which has two good actors who have, unfortunately, passed away." 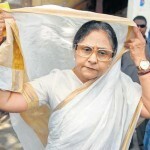 Talking about the film, producer SP Seth said, "Jayaji plays a blind girl and Vinodji plays a cameraman, Amrishji as usual plays a menacing villain." 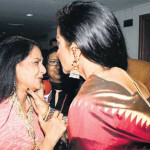 Is Rekha going to kiss or kill Jaya Bachchan ?? Reviews of "RGV Ki Aag"